Take the this as an opportunity to find a butcher in your area and build a relationship with him or her. Butchering is a dieing art and shops that are dedicated to that art are very hard to find these days, but your best bet of finding quality Colorado lamb will be to talk to your local butcher. Colorado lamb has a more delicate flavor with a milder gameness to it, compared to what you might find from other parts of the world. If you can find a local producer of lamb in the South then go for it, but I consider Colorado local in this case especial in context to New Zealand. Also ask for bone in leg of lamb, it adds flavor to the meat as it cooks, and helps to keep the meat from over cooking, as we are shooting for medium-rare doneness. Lamb is a great alternative to beef and pork roast, and like those it’s all about the seasoning and moisture control. You can use all combinations of rosemary, thyme, parsley and oregano with mint, paprika,onion,garlic and dill ; each flavor will change and be aromatic and brought out during the cooking process. The trick I use to getting my herbs really infused and worked into my lamb is to make a paste out of them with olive oil in a blender, rub them into the lamb so it gets encrusted with the flavor. Be sure to use a meat thermometer, I can say this enough. Bone in lamb pulled from the oven at 135 degrees and rested will render absolute perfection! A delicious tender change from my pork obsessions. A recipe everyone can celebrate with this holiday season. Stay Hungry Y’all! Note: I prefer a bone in lamb for flavor and when cooking it will regulate the cooking temperature of the lamb cause the lamb to cook to a cooler temp keeping a more mid rare perfection. 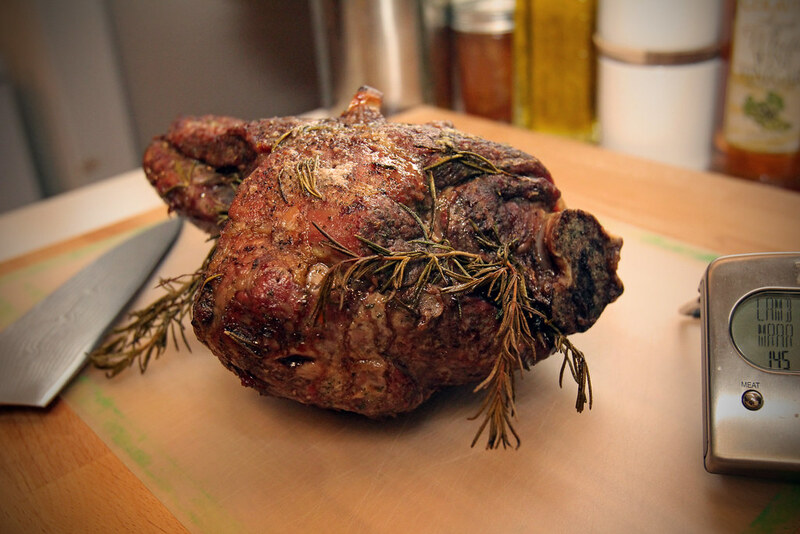 Prepare the leg of lamb by removing any unwanted silver-skin and or fat or excess. On the thickest part of the roast cut 7 to 10 , 1/2 inch to 1 inch deep incisions and insert the garlic halves. In a blender or food processor place the parsley, mint and a pinch of salt and pulse to get started. Then begin blending adding olive oil creating a paste, similar to pesto. Cover the lamb liberally with the oil parsley mix. Where the bone meets the roast and around the joint insert springs of rosemary and cover the rest of the leg of lamb with lose rosemary liberally. Apply salt and pepper to both sides of the leg of lamb and allow the to come to room temperature. Preheat your oven to 325 degrees. Roast the lamb on a rack uncovered until the internal temperature at the thickest point of the roast reaches 135, remove the lamb and tent with foil and allow to rest for 45 minutes to 1 hour. Serve and enjoy !